This blog would have looked nice if I started thrown in a nice picture of our Cisco FlexPod solution. Be patient, we’ll get there soon. To better understand the benefits of Cisco UCS lets first look at how a Hyper-V Cluster would look like with traditional hardware and what challenges arise. As you can see this results in a bunch of network adapters and cables. In some scenarios this can be quit complex and what most people don’t realize is cabling like this consumes a lot of power. In fact not every bandwidth is used efficiently, which makes the price per port costly. As you know, with Windows Server 2012 and later it is possible to team several network interfaces and configure converged networking on top of the team or even on top of a vSwitch. But to get enough bandwidth and redudancy you still need multiple interfaces. And depending on the NIC teaming mode in most cases it does not increase bandwidth for a single session as it only passes through one network interface. I will write a blog about teaming at a later time. Of course you can use 10Gb interfaces instead of 1Gb interfaces, but one way or another you still need to separate interfaces for each function. Each physical server assembly is built upon a so called hardware profile. For standardization it is best-practice you keep that hardware profile the same on every physical server. So the choices you make can stick with you for a long time. “Scale-up” means you (can) add things like more memory, additional processors or even network adapters. Most often that is quite easy to do. But there are some limitations. Suppose you want to replace a motherboard with a newer processor architecture. Or depending on your hardware model, you might not have enough room (e.g. slots). In most cases that would result in total hardware replacement and re-installation of the Operating System, which is a pain. “Scale-out” means you (can) add more physical servers. But more servers means more cabling and before you know it you run out of switch ports. Of course you can add switches, but those switches need to interconnect with your existing switches. A network can grow quit complex and at some stage have bandwidth issues. And as a result you get more network devices to manage. Now… this is almost history. There is an evolution going on at the datacenters. Cisco and other vendors are working hard to change the way we deploy compute and connect network resources. That’s why you read al these new terms like “Converged Infrastructure”, “Converged Networking”, “Unified Fabric”, “Unified Ports”, “Stateless Computing” and so on. And particularly Cisco has come a long way in the industry to make our job much easier. Cisco UCS (Unified Computing System) for compute. Cisco Nexus (and UCS) for network. Cisco also has a solution with EMC storage called Cisco Vblock. Of course you can buy Cisco UCS without NetApp or EMC storage devices. You can even use or combine your own storage devices. Nevertheless, a Cisco FlexPod or Cisco Vblock is a good solution to start with if you are looking for a robust datacenter architecture with dozens of validated designs, white papers and deployment guides. And from my own experience; Cisco- and NetApp Support is very good! Now let’s have a look at some of the benefits of Cisco UCS and wat it does in terms of scalability. A Cisco FlexPod offers a Converged Infrastructure which serves as a platform for hosting a public-/private cloud service, including IaaS (Infrastructure as a Service), PaaS (Platform as a Service) and SaaS (Software as a Service). A number of features are ideally suited for deploying a Cloud service. This includes pooling of shared resources, automate and allocating resources. With a Converged Infrastructure everything is brought together in a single fabric. As mentioned; For Ethernet you need Ethernet adapters and Ethernet switches, for Fiber Channel you need Host Bust Adapters and Fiber Channel switches. As with most cloud infrastructures, a lot of I/O protocols are involved which normally requires a lot of components and cabling. Which results in complex network infrastructures and high energy consumption. Cisco UCS is a platform where various I/O protocol are brought together in one ‘single-wire and management’, known as a Unified Fabric. No need for separate switches. UCS is a system that supports almost every protocol and transport carrier, like Ethernet, FC (Fiber Channel) and even FCoE (Fiber Channel over Ethernet). A Unified Fabric simplifies the network significantly by means of network virtualization and efficiently utilizes shared resources. It is perfect suitable for dynamic workloads and reduces energy consumption. You might ask, what is so special about a Unified Fabric? Well, this is what makes it so much easier and in the same time highly scalable. For instance, you can connect almost any network device to Cisco UCS. Let’s say you have an uplink switch that connects to your corporate network, a storage device that uses iSCSI and another storage device that uses Fiber Channel. You can connect all of them easily. Then you can provision (and even virtualize) them as resources to your Cisco UCS servers. For example, you also configure the VLAN’s from your uplink switch in Cisco UCS. Those VLAN’s are then available as network resources. When a server administrator configures a server (known as a Service Profile) it can select those network resources without needing a network engineer. In the same time those network resources are optimally configured on the physical server and switches. Once you have used it, you love it! A Converged Infrastructure is in fact a new evolution of data center network infrastructures. It allows for both a technical and business efficiency. We already experience the benefits of server virtualization. Server virtualization cannot operate without other resources, such as network and storage. Cisco UCS focuses on all those aspects, what makes for the best flexibility in the field of hosting. In addition Cisco UCS has a tight integration with virtualization platforms like VMware and Hyper-V. Cisco UCS offers full support for a wide range of innovative features, such as VM-FEX (Virtual Machine Fabric Extender), SR-IOV (Single-Root I/O Virtualization), VMQ (Virtual Machine Queuing), vRSS (virtual Receive Side Scaling), Nexus 1000V and more. A key benefit of Cisco UCS is the concept of Stateless Computing. In fact, a physical UCS Blade Server has no configuration at all. It has no embedded UUID, no MAC Addresses, not even BIOS settings. A physical UCS server does contain a CNA (Converged Network Adapter), like a so called Cisco VIC (Virtual Interface Card). At first the server is kind of brainless, just a hardware resource that is available to you. Instead, Cisco UCS allows you to build your own server configuration. As if you are building a recipe with all the required ingredients. May your wish come true. A server configuration is put together in a so called Service Profile. A Service Profile contains all your ingredients, like settings, resources and polices. It also contains converged network interfaces called vNICs (virtual Network Interface Cards) and vHBAs (virtual Host Bust Adapters), in a desired PCI order. Each vNIC will have it’s own MAC Address (from a resource pool you created manually), optimal settings and etc. With a Cisco VIC within a physical UCS server, it is even possible to create a Service Profile with 256 vNICs/vHBAs. A Service Profile can then be applied to a Blade- or Rack Server. The server will boot with exactly that configuration. The vNICs and vHBAs are presented to the Operating System as Gen* PCI-E Network Adapters. Cisco UCS allows you to create a Service Profile Template (for a typical server role) and clone new Service Profiles. This ensures consistency across all servers. For example, you can build a Service Profile Template with all the ingredients for a VMware Server or Hyper-V Server. That Service Profile Template contains all the vNICs (and vHBAs) you need, each with the right VLANs (and VSANs) assigned, all the required BIOS settings, including several policies. When you need to replace or upgrade a UCS server, you can simply ‘disassociate’ a Service Profile from the original server and ‘associate’ it to another server. The exact configuration with all the ingredients move with it. Almost similar like you would move a VM from one host to another host. You literally virtualize your server configuration like you would with a VM. Of course you need to boot from SAN to make it work. Cisco UCS provides full and robust support for boot from SAN, for both iSCSI and Fiber Channel. Each cloned server has exactly the same configuration, but each with a unique UUID, MAC Addresses and etc. You can upgrade servers easily, you can replace servers easily, and you can add servers easily. All can be done within minutes! Stateless Computing adds flexibility in terms of Scale-Up and Scale-Out. Personally I am quit impressed about all this. It makes deployment, scale-out and such so much easier. No need to switch fabrics and keep track of complex cabling. Adding (I must actually say creating) a new servers, giving it vNICs (and vHBAs) interfaces and connecting them is so easy! A FlexPod is fully redundant. With traditional physical servers it is often common to use NIC teaming. NIC teaming requires the necessary configuration within the Operating System. With Cisco UCS there is no need for NIC teaming. Cisco UCS offers Fabric Failover. Fabric Failover ensures that if a physical link or whole network component (from Fabric A or B) fails, it will do an automatic failover to another network component (from Fabric B or A). This is an active/passive configuration. The Operating System running on a Cisco UCS server only detects a single converged network interface. Fabric Failover offers hardware based redundancy, which simplifies your configuration and deployment. Fabric Failover is optional. If Fabric Failover is used you need to choose whether the vNIC is actively connected to Fabric A or B. Of course you still have the option to add two vNICs to a Service Profile and configure NIC teaming, although it is not recommended. And if you need to have iSCSI connectivity with MPIO (Multi-Path I/O). You simply create two vNICs, the first vNIC connected to Fabric A and the second vNIC connected to Fabric B. Same thing for vHBAs with MPIO. 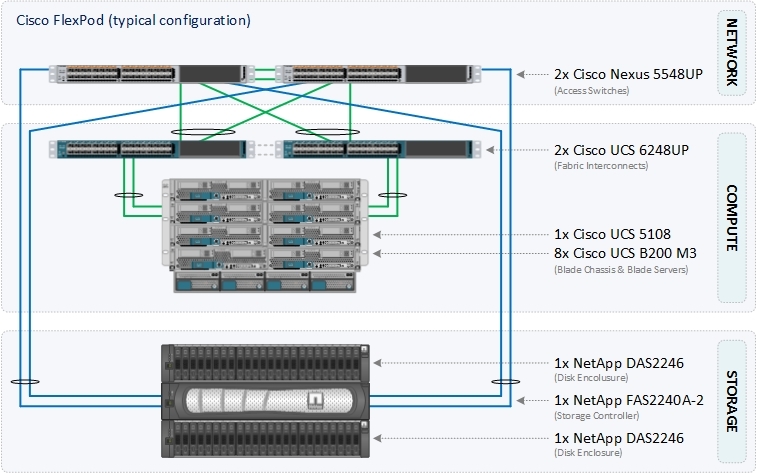 Cisco UCS offers enormous flexibility in terms of Scale-Up (upgrade) and Scale-Out (expand). Among other things, thanks to a Unified Fabric and Stateless Computing it is very easy to add new Blade Chassis and Rack Servers, upgrade or replace them. You can connect multiple network devices to Cisco UCS, like uplink switches, directly attached storage devices. Especially for a Public Cloud service, where one has a lot to do with a dynamic workload, it offers many benefits. You can connect as many network devices to Cisco UCS as long as you don’t run out of ports. 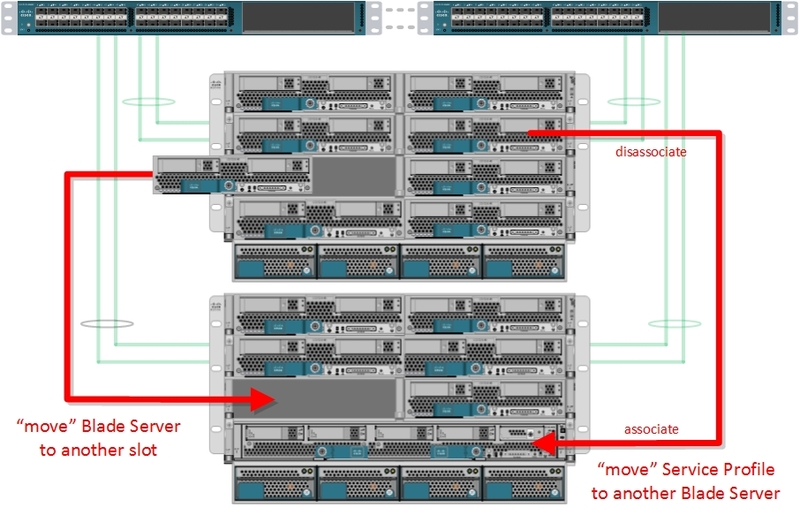 You can connect a maximum of 20 Blade Chassis or 160 servers to Cisco UCS. You can connect both Blade Chassis and Rack Servers. Cisco UCS has a simplified and automatic firmware management system. If configured; when you connect a new Blade Chassis, all components (like Fabric Extenders and Blade Servers) will be automatically updated for you. Same thing when you insert a new Blade Server in an existing Blade Chassis, all server components will be automatically updated. And with updated I mean every single component! Including motherboards, CNAs, RAID controllers, Video Adapters, KVM consoles, disks, Fabric Extenders, I/O Modules and etc. When a new firmware-/software package is released; you can import it and Cisco UCS allows you to automatically update all your servers automatically! This can save you a lot of time and ensures consistency across all your servers. The entire UCS system is managed by a system called UCS Manager. Everything in terms of compute and network is configured and managed through UCS Manager. UCS Manager provides a single-point of management for network- and server administrators. UCS Manager is accessible through a web console. It is also possible to use PowerShell scripts against UCS Manager. UCS Manager includes all the KVM consoles. If you want, you can monitor your UCS environment with SCOM (System Center Configuration Manager). SCOM only has to connect with UCS Manager. SCOM will then collect the information from all your UCS devices. Ok, for now I think this is enough information about Cisco UCS. It’s time to show you my first Cisco FlexPod configuration. Continue reading by clicking on the link below. Excellent post! Very well written and very informative. Any ideas when the next blog post will be published? Thank you! It should already have been finished by now. But the fact is, I have been very busy lately. I’m planning to finish the second and third part next month. This is a very nice article regarding this Fabric Management solution. Have you tired to build a setup which facilitates SMB 3.0 shares on the NetApp FAS? As far as I know you should be able to create them which would greatly simplify your Hyper-V cluster setup? The NetApp FAS from this blog is configured in 7-mode. Unfortunately it must be running in cluster-mode to support SMB 3.0. Also keep in mind that you do not have SMB Direct unless you use a newer Cisco VIC with RDMA support within your UCS Server. I also like SMB 3.0, it indeed simplifies your configuration. But to support boot from SAN you still need FC or iSCSI. Just for your information. All parts are now published.